Melbourne Cup flops Yucatan, Ventura Storm and Who Shot Thebarman are among the nominations for the 2018 Group 2 $300,000 Zipping Classic (2400m) at Ladbrokes Park at Sandown on Saturday. 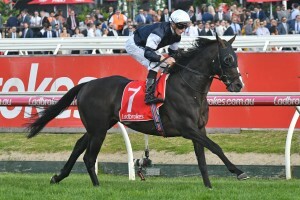 The Lloyd Williams owned, Aidan O’Brien trained Yucatan was sent out as the $6 favourite for the 2018 Group 1 $7.3m Lexus Melbourne Cup (3200m) at Flemington last Tuesday, but struggled at the end of the two miles to finish in eleventh spot, eleven and three quarter lengths behind the winner Cross Counter. The Lindsay Park trained Ventura Storm ($31) finished just ahead of Yucatan in tenth spot while Chris Waller’s Melbourne Cup warhorse Who Shot Thebarman ($31) was a well beaten seventeenth. Yucatan has since been transferred to Williams’ stable at Mount Macedon under the care of trainer Liam Howley who has also nominated the Williams owned Homesman, Sir Isaac Newton, Midterm and last year’s winner The Taj Mahal in the Zipping Classic. Who Shot Thebarman’s stablemate Libran is also among the sixteen nominations for the Zipping Classic. Lindsay Park co-trainer Tom Dabernig, who trains in partnership with David and Ben Hayes, said that Ventura Storm had come through his Melbourne Cup run in good order and the stable thinks the drop back to the 2400m will suit the European import better. Earlier betting for the Zipping Classic at Ladbrokes.com.au has Yucatan as the $2.80 favourite just ahead of his stablemates Homesman at $3.20 and The Taj Mahal at $8.